At Connection, we have chosen to break with hot air, lack of follow-up and implementation, lack of connection between the employee and the management, too many tools without application, results not being achieved and too unrealistic expectations which are never met. The result of this is several hundred customers spread all around the world. They have all, without exception, been experiencing a value of the partnership. A selection of these can be found on this page under ‘About Us/Cases’. When changes succeed and are completed, do you think much of it? The behavioural model is a great idea in all we do. We believe that people consist of five dimensions which are all of great importance to the ability to achieve our goals. Therefore, we will always take as our starting point the causes which either limit or hinder each individual in achieving his goals. 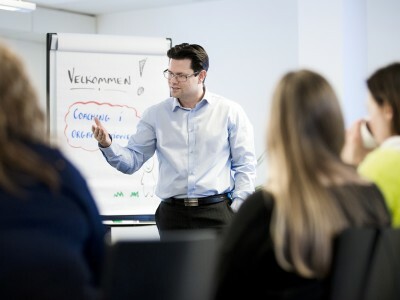 Through the years, Connection Management has educated more than 20.000 people in big Danish and international companies. We are creating lasting results through our view on education. We want to contribute to the increase of productivity and efficiency in your company with 20% as a minimum in an operational and implementing way. At Connection Management, we develop employees and managers with a purpose of improving the bottom line. We live up to our name and we are ensuring productive connections between customers, company, management, employees and results. It is not only about solving a problem in the right way, but also about solving the right problem. All consultants at Connection Management are razor-sharp and they have demonstrated lasting results for their customers. Furthermore, the consultants are certified in a number of tools, well-educated and have a great practical experience and insight into both business life and the public sector. Take a journey around our website and get inspiration to how we are able to help you realise an improvement of 20% as a minimum.